5 Forgotten Bar Cart Essentials Every Bar Cart Must Have! I was happy for another opportunity to create a style board for Chairish. My last board featured Chairish bar stools in a sleek vintage chic home bar setting… more on that here. 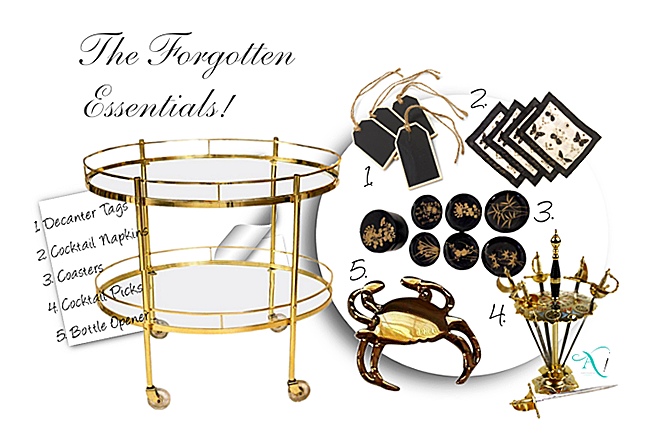 This time it’s all about the essentials every bar cart owner must have! Well now, this is definitely a style board that makes me feel right at home. 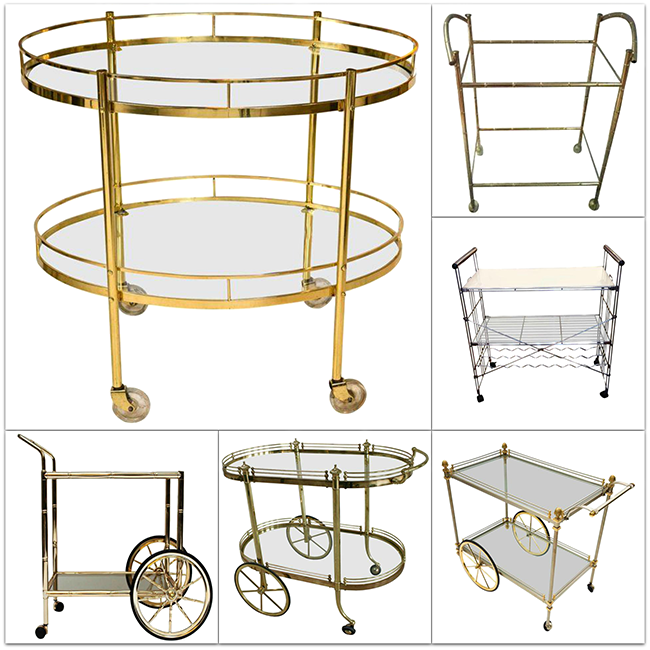 Chairish provided these six bar carts to choose from, but definitely check out their bar cart section to see the full suite of options! I love the simplicity of this piece, it’s sleek lines and elegant oval shape. I am a weak-kneed fan of classic Hollywood glam, and just know this bar cart is dying to showcase some glamorous barware, sparkle and shine! 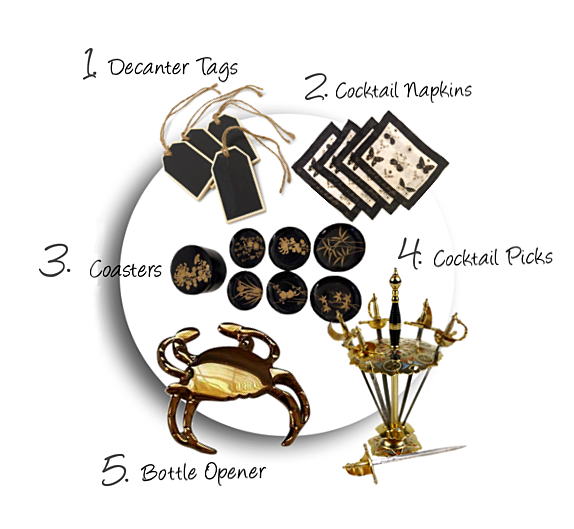 Instead of featuring typical barware basics for bar carts, I decided to highlight five essentials that are often overlooked. That’s right. These five little essentials can take your bar cart from ‘doing it right’ to down right cool-worthy (underscore)! I think you need at least one decanter if not three, to set the tone. They are showy and useful, but it sure helps to know what’s inside! 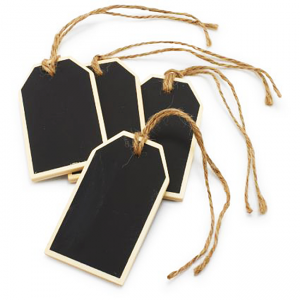 Engraved silver decanter tags are super stunning and on my list of favourites for sure, but I’m all over these chalkboard labels. They let you change things up easy-peasy, and it doesn’t hurt that they are sleek in black but still keep things fun and light. Nothing serves a classic cocktail in a classic vintage coupe better than a beautiful napkin. We’re used to so many awesome paper choices, but why not go green on this? 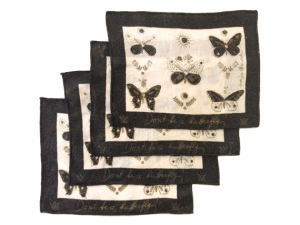 These vintage napkins are pure linen and designed by Mid Century great, Georges Briard. You know who Georges Briard is right? No, not just any coasters! 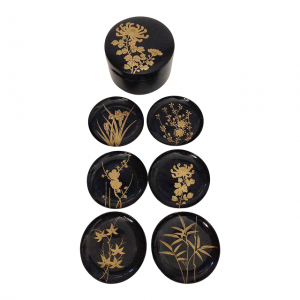 This brass bar cart is screaming for a touch of classic Hollywood Glam, and we have that in spades with these vintage black and gold lacquer coasters. And why coasters anyway? Well, they’re great for the stemless cocktail glasses, and they add a touch of cachet! If you’re going to serve a classic martini then you’ll need skewers for the 3 olives please! 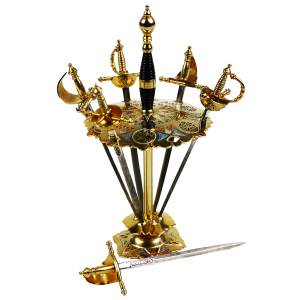 Actually, you will garnish many-a-cocktail and will be glad to have a swanky set of cocktail picks, or in this case vintage Toledo swords. Throw out the wooden toothpicks. There’s no place for them here! Your bar cart is a statement piece and it’s meant to pop. Well, that’s exactly what this brass crab will do. 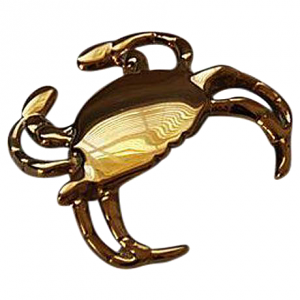 Who knew this shiny crustacean was actually a bottle opener in disguise? You can go in many directions with your bar cart, there are just so many options and styles. 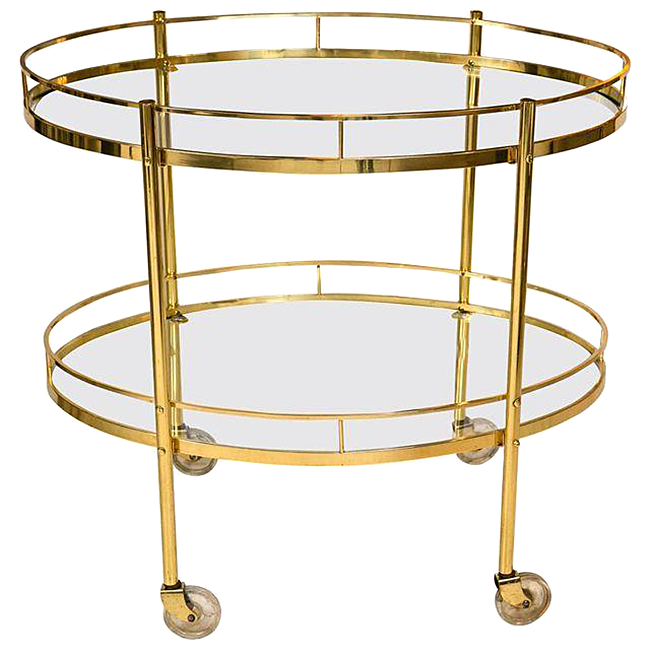 But if you’re going with a brass bar cart like this you will want to stock up on glam barware basics, add a garnish and some splash with these forgotten essentials of the bar cart mix! And so… what’s next on your bar cart essential list? These Georges Briard cocktail napkins are definitely on mine! Update: I couldn’t resist!! 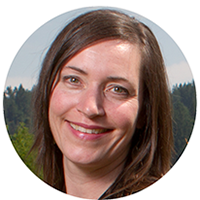 Wanna see… click here! Photographs for Chairish pieces taken from Chairish.com – click on product images for direct link to each source. Please link and credit if you choose to use!